The Frictionless Tools offered by Aaron Mahnke of Frictionless (also another co-host on the glorious 5by5 network) are in the same vein as other planning products, such as the Emergent Task Planner. Even though they're similar, the Frictionless Pad is much more open-ended and versatile, which is a huge benefit when you need some thinking space or aren't sure what kind of meeting you're about to walk into. Aaron also sells a smaller version of the pad and Capture Cards, which are gorgeous index cards. We'll get to those later. First, let's take a detailed look at the Planning Pad. Truly, you can make this pad do anything you want. Most of the time, I use the left gray column to serve as a timeline for the day. I list out the hours and start planning my tasks and events. But the beauty of the blank template is that I could also purpose this as a long task list, a grocery list, or a margin for notes and comments in relation to the writing in the large white block to the right. The possibilities are endless. The top of the sheet has boxes for a date and subject (and again, anything else you want), which is helpful for providing context later or when it's time to file it away. Finally, there's a large gray box at the bottom of the sheet that extends from left to right. Again, this could be used for anything you need. Who am I to tell you what to do with it? I designed them for myself because I wanted a small amount of structure, and a whole lot of freedom. A beautiful and useful balance of structure and freedom. 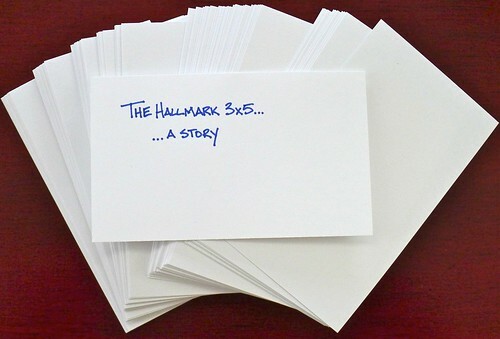 The pad contains 50 8.5x11" sheets that easily tear away. The site doesn't detail the paper used in the pad, but it's good stock. Since there are colors on the sheets (gray and red), you can expect inks to behave a little differently depending on the area you're writing on. I found that the white areas are more absorbent and create a thicker line, but the shaded areas are less absorbent. All things considered, the paper does incredibly well with all types of pens. I tried all types and was pretty happy with the results. For my personal preferences, I'd stay away from fountain pens larger than a fine nib. If it was a contest, gel inks would win on this pad. If I had to guess, I'd say Aaron is partial to micro-tip gel pens, which perform fantastically. My Sailor High Ace Neo is my favorite fountain pen for this paper. The paper is a little grippy, which is good. If you have a fountain pen that likes to dig, this might be problematic. Just write lightly. Overall, this is great paper that is a pleasure to use. Now, on to the Capture Cards. These are my favorite index cards. The stock is heavy, but extremely smooth. All of my pens feel smoother and frictionless when writing on these cards. They have a similar layout, but even less structure. There are a couple of boxes on the top of the card (gray and red or gray and green), and a small gray box at the bottom. The white mid-section is full of a light grid. The back of the card also has the grid and a couple of small boxes on the top and bottom portion of the card. So simple and so effective. When I write on these, they make me smile. When I hand these to people with notes on them, it makes them smile and ask about them. Luckily, there's some small branding on both the cards and the pad for people who want to know more. If grid paper and awesome index cards are in your interest zone, give the Frictionless Tools a try. I've been very pleased (especially by the Capture Cards) and plan on buying more when I run out. Although, I'd probably go for the smaller Planning Pad next time to see if that size suits me better. Posted on December 27, 2013 by Jeff Abbott and filed under Frictionless, Index Card. Part of being an addict is sometimes buying things you don’t need. I knew good and well I didn’t NEED these Oxford Mini Index Cards but I was a Staples and gosh darn it, I was leaving with something. I know, just take a pair of scissors to my stack of 3 x 5’s and boom - mini index cards! As it turns out, that would have been the right call. One of my biggest pet peeves in the world is bad line or grid alignment on paper. It is so off-putting that I cannot use the product. 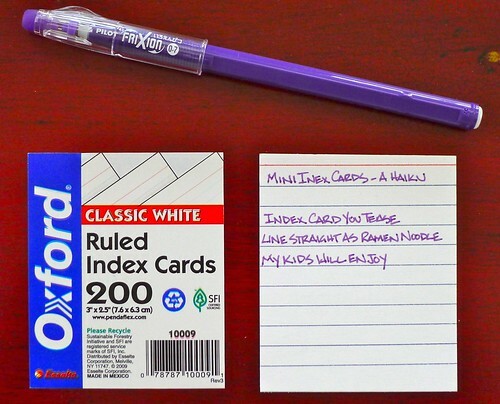 That is the case with these Oxford Index Cards. Just take a look at the picture. Awful. Even if the lines were spot-on this isn’t a great card. The paper is flimsy and rough. Next time I’m tempted I think I will take my scissors advice. Or, just light a dollar bill on fire and watch it burn. That would have been more fun. Posted on March 23, 2012 by Brad Dowdy and filed under Index Card, Oxford.